Throw on your eyes and ears and let the big bore rifles bark with this 500-round case of .308 Winchester from Wolf's Military Classic line. 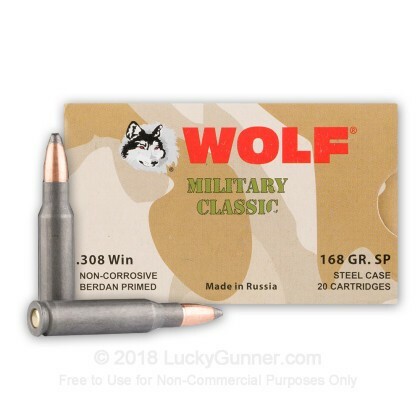 This brand of cartridges utilizes steel cartridge casings which are not reloadable, but very inexpensive to produce, allowing you to build up a functional stash at an affordable cost. Each casing has a non-corrosive Berdan primer fitted to its base for clean ignition that won't eat away at metal parts. The loads is topped of with a 168-grain soft point bullet with a bi-metal jacket and exposed lead nose. 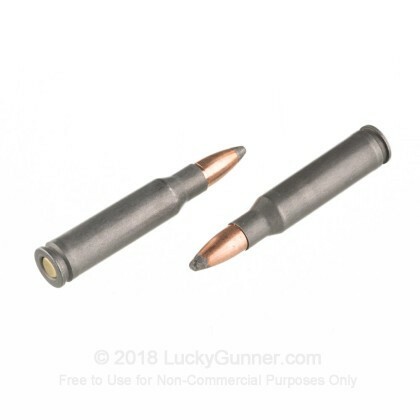 This style of construction allows the bullet to open up widely as it enters a target; this expansion helps transfer greater energy to vital areas while hastening bleed out for humane and effective deer or hog hunting. 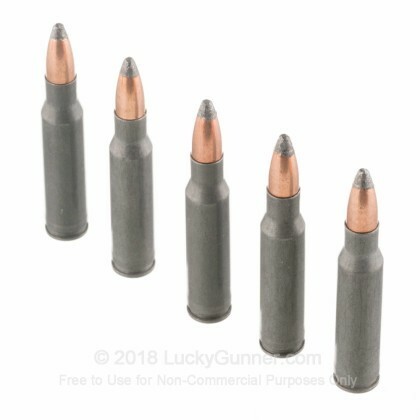 168 grain is a common heavyweight rating for the .308 Winchester caliber that is often used for high-performance Match loads. 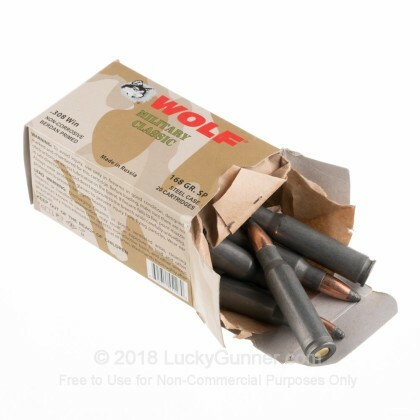 Wolf Performance Ammunition is based in California and sources its ammo from Eastern Bloc factories with centuries of mass production experience. I shot several groups around 1.5-1.75 inches. No failures. It shot tighter groups than the Federal 149 grain and the Winchester Super X 150 grain that I also tried. Bear Creek Arsenal 16 inch barrel. Delivery was fast as usual. 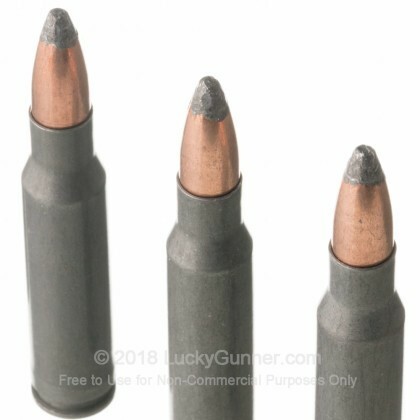 Ammo is nice to stock up on for multiple use. Cheap for range use, good exposed lead for hunting or SHTF use if the need arose. This ammo is reasonably accurate, stock up and shoot often. Not match grade, but great for general purpose. I have many .308, my Ruger Gunsite Scout loves this ammo. 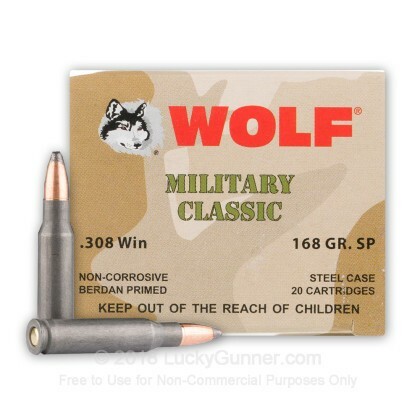 We also have this 308 - 168 Grain SP - Wolf Military Classic - 20 Rounds ammo in stock in a smaller quantity.